I finally threw this away this week. This was my first ski helmet; it was also the first piece of specialist ski equipment I ever bought. I got it in Sauze d'Oulx in 2010. I'd gone with money and intentions - I wanted to finally buy my own pair of ski boots; but when we went to ski fit, the fitter couldn't find any that fitted me. I was in tears. I'd already tried to get ski boots at Snow and Rock, where the fitter had eventually given up and suggested I switch to snowboarding. So, I got this helmet instead. It did lots of ski trips with me, probably more than it should have done. I remember falling over backwards (how, I'll never know) and knocking my head on the slope at the end of my first week of wearing it, so it was probably fairly useless after that, but I liked it. Still one of my favourite selfies ever. 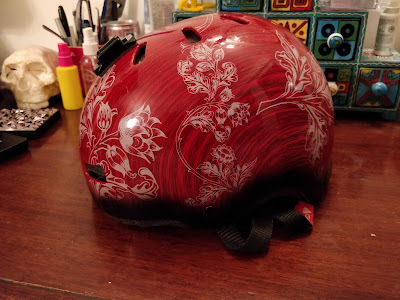 I retired this helmet when I bought a new blue one in 2014 but it has taken me until this long to finally throw it away. I did consider recycling it but I'd live in horror of it going to a charity shop and being used as a new helmet by someone who subsequently got a head injury. Yes, I've definitely overthought it. The sad helmet buying episode did have a happy ending, by the way, because I went back to the boot shop the next day and was sold a pair of ski boots by a slightly creepy man from Folkestone. He kept jumping up and down. 'I've got a hole in my boxers and every time I do that my willy swings right out of them,' he explained. Erm...not really OK, but OK.